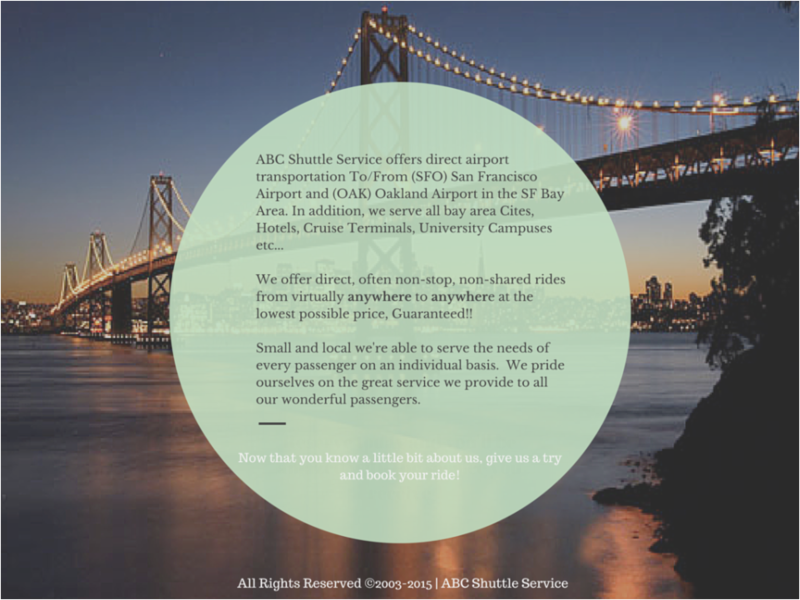 Our Story + Testimonials - ABC Shuttle Service | SFO & Oakland Airporter | Cheapest Rates, Very Reliable, Easy Online Booking! Book your ride and you'll be amazed with the service you recieve. "Our driver was early and waiting for an early Sunday morning pickup and they sent me a nice black sedan (instead of their clean blue mini-van I was expecting). which was nice - spacious, clean, comfortable with leather, including tinted windows in case you need to travel incognito and a fresh travel size bottle of water." See Horace's full review here! "Booked ABC shuttle to SFO from Alameda. Z Junior arrived 5 minutes early, called to let us know he was out front...Easy booking on website. Highly recommend and will definitely use again!" See Cindy's full review here! "I think it's important to point out that their prices are really reasonable as well compared to others. They do direct service to the airport and DO NOT drive around for hours picking up people. which is why I will always go with these guys." See Marry's full review here!